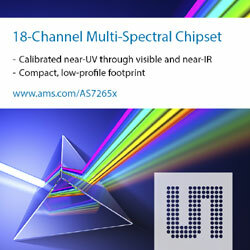 Premstaetten, Austria (16 January, 2018) -- ams (SIX: AMS), a leading worldwide supplier of high performance sensor solutions, today launched the AS7265X, a highly cost-effective 18-channel multispectral sensor solution, opening the door to a wide range of new spectral sensing applications. The 18-channel 3-chip calibrated visible through near-infrared chipset is ideal for emerging spectral sensing applications such as horticulture, fluid quality/spectral component analysis and complex spectral identification, including anti-counterfeiting and authentication. Today’s announcement brings the new 2017 offerings from the AS726x multispectral sensing products to 4 unique solution sets, including 6-channel visible, near-IR, true color and 18-channel family members. The AS7265x chipset consists of 3 highly integrated 6-channel sensor devices, each only 4.5 x 4.4 x 2.5mm, in efficient land-grid array packages with integrated apertures. The master-slave-slave architecture appears as a single logical device, simplifying system integration and decreasing time to market. The 18-channels span wavelengths from 410 to 940nm with 20nm filter widths. “This cost effective product family will have a tremendous impact on the industry, creating broad opportunities for sub-$100 spectral sensing instruments. Prior to the announcement of the AS7265 family, comparable sensor solutions cost $100 or more, pushing the cost of instruments built with them into the $1000 range or higher”, said Tom Griffiths, Senior Marketing Manager at ams. The AS7265x multispectral sensor family is the first multichip set from ams to incorporate nano-optical interference filters deposited directly on the CMOS silicon die cost-effectively enough to open entirely new application opportunities. This interference filter technology delivers extremely precise and reproduceable filter characteristics, which are stable over both time and temperature and are much smaller than the typical component solutions needed for higher channel count spectral analysis instruments. The AS72651/652/653 chipset is calibrated at the factory, delivering a normalized 35 counts/µW/cm2 across the entire sensed spectrum, simplifying algorithm development and elimina-ting the need in many applications for end device calibration. Combined with the high filter stability over time and temperature, this allows a “calibrated-for-life” design that lowers both components and manufacturing costs, and enables these new application spaces. The chipset is implemented in a master/slave/slave arrangement, each with six spectral sensing channels. Integrated intelligence enables the calibrated digital output and manages the interface to the host microprocessor via the selectable choice of I2C or UART interfaces. The combined set’s 18 channels are 20nm full-width-half-max, with wavelength centerpoints at 410, 435, 460, 485, 510, 535, 560, 585, 610, 645, 680, 705, 730, 760, 810, 860, 900 and 940nm. Operating as a 3-chip set, the devices include electronic shutter capabilities with 3 independent 100mA LED drive controls, which means that device designers can accurately control multiple light sources to enhance the spectral sensing functions without added componentry. The small size of the new AS7265x chipset sensors combined with their low power consumption enable measurement equipment OEMs to develop new product types that take advantage of these unique attributes. The AS72651, AS72652 and AS72653 are in volume production now. Individual pricing is $4.00 each, translating to $12.00 for the full set in order quantities of 1,000. For more technical information and sample requests, please go to http://ams.com/Spectral-Sensing/AS7265x.